In June 2004, Williams launched Your Legal Resource, a lawyer referral and consulting service that connects clients with the best attorneys for their particular situations and guides lawyers and other professionals who want to grow their practices. As a family law attorney, I enjoyed my work and my clients, and I generated a good income. However, I decided to pursue something that would bring me joy, use all my gifts, and allow me to make a difference to others every day, says Williams, who sees herself as a matchmaker at hearta relationship builder, not a relationship ender. A 1989 graduate of Detroit College of Law (now MSU College of Law), Williams became a co-founding partner in the general practice law firm of Ahles & Tollefson. 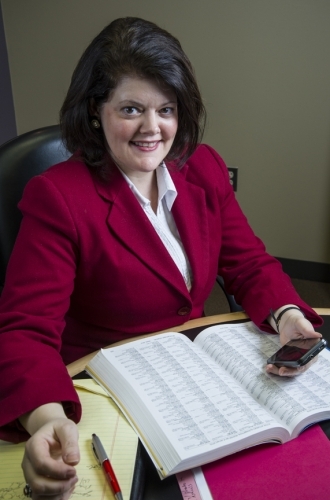 She created her own law practice as a solo family law attorney in 1993. In 2004, with the establishment of Your Legal Resource, her focus shifted from the practice of law to the business of law. Within a short time, that role evolved to include additional business consulting services for attorneys as well as professionals in other small businesses. To achieve the first part of her goal, Williams developed a network of reputable and dedicated lawyers who practice in a variety of disciplines in the Metro Detroit area. She drew upon the expertise of a team of attorneys she had known personally and professionally from her years of practice. Research showed that 75 percent of Americans chose an attorney by asking a friend or family member for a reference, with fewer than 35 percent being satisfied with the services they received. That is why Your Legal Resource goes beyond the casual I know an attorney referral and takes the time to understand each case and each clients financial situation and personality before recommending an attorney who will be a good fit, Williams explains. Client Vicki Brown is the owner of Fresh & Clean Dry Cleaners in Beverly Hills. She used Willliams services after the two met at a ribbon-cutting ceremony for another local business. We got to talking and I took her card in case I ever needed an attorney, says Brown. A few months later I was expanding my business and needed some employment contracts drawn up and turned to Lori for a referral. I was very pleased with her services and the attorneys she referred me to. They knew exactly what I needed and took care of it right away. As Williams expanded her cadre of services, she included legal consulting for solo and small-firm attorneys, becoming a resource to not only clients in need of legal services, but also to the legal and business communities. Her own experience as a solo practitioner has helped Williams understand the myriad details a business owner must manage. I guide attorneys and other business professionals through the process of generating more business through effectively branding and marketing their services, becoming skilled at networking, and developing referral relationships and strategic partnerships, explains Williams. Most business owners want to concentrate on their product or service and not have to be the networker, marketer, operations manager, finance department, biller, collector, etc. I can direct them to the other resources they need and work within their budgets. I show them cost-effective ways to grow their practice on a solos or small firms budget, and I introduce them to their target referral partners. Consulting clients offer similar praise but from a different perspective. Employment attorney John Holmquist sees clear benefits from working with Williams. As an experienced attorney moving into a solo practice, I contacted Lori for help in marketing and in connecting with potential strategic partners, he says. Her help has resulted in concrete relationships. I will continue to work with Lori and appreciate her expertise and her connections. Bankruptcy attorney John Lange is one of the attorneys to whom Williams has referred clients over the last several years. I respect and appreciate the quality of the referral and the overview of the potential clients information provided by Lori before I even meet with the client. She also interviewed me for her blog, and I was very impressed with how she took the raw information and transformed it into an informative blog entry. Lori also does a fantastic job with helping you network with other professionals. Consider attending one of her events. Those events range from networking to conducting educational seminars to teaching professional business owners about sales, social media, how to generate referrals, and other marketing or networking skills. The Cocktails and Connections event, created by Williams and held every February and August, is a favorite of local professionals in the area. I see the event as a strategic cocktail party, where the people in the room are relevant to one anothers businesses, Williams says. Im always complimented on the event by the attendees because of the caliber of the people present. Its not your run-of-the-mill mass networking event. I hand-pick the attendees from the legal, accounting, financial services, banking, coaching/consulting, and marketing industries. Its a good mix because everyone in the room is looking to meet someone that fits their target market or referral partner preference, and they come away with good connections. I keep the attendees under 50 to create more intimacy so everyone has a chance to meet quality professionals and start to know one another. Williams wears a number of professional hats, such as membership co-chair for the Womens Bar Association, which is the Oakland Region of the Women Lawyers Association of Michigan. She is an active member of and ambassador to The Collaborative Group in Birmingham, a member and former Ambassador of the Year of the Birmingham Bloomfield Chamber of Commerce, a blogger for two local online publications, and a member of the Birmingham Campus of Kensington Community Church. She also is the mother of two sons: Daniel, a student at Birmingham Groves High School, and Andrew, a student in MSUs James Madison College. I have much to be thankful for, say Williams, who celebrated her 2,000th referral for legal services in early January. If it werent for the support of those who refer me clients in need of legal services, and the great service rendered by my team of attorneys, Your Legal Resource could not exist. I look forward to helping the next 2,000 clients in need of legal services, as well as helping professionals achieve their goals in the coming years.